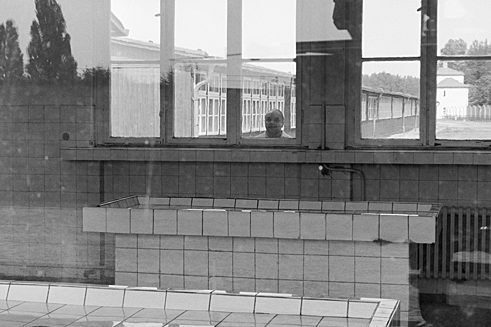 For his film “Austerlitz”, Sergei Loznitsa observed visitors to concentration camp memorial sites with his camera. What can commemorative culture achieve today? An interview with the Ukrainian director about his award-winning documentary. Mr Loznitsa, you’ve been living in Germany for many years. After documentary films about the events in Maidan Square in Kiev and the attempted putsch in Moscow in 1991, you’ve now made a very impressive film about visitors to the concentration camp memorial sites at Sachsenhausen near Berlin and Dachau near Munich. How did you get on to this subject? The starting point was my first visit to such a memorial site, in Buchenwald. It was odd; I didn’t know what position I should take towards this place. To find this out was the reason for me to make the film. How do I, as a tourist, experience such a place? These former concentration camps are, on the one hand, memorial sites and cemeteries, and on the other hand places for learning that give the visitor an idea of how the machinery of destruction worked. In your eyes, are these two aspects difficult to reconcile? In my opinion, these two aspects, memorial site and place for learning, work against each other. And that’s why people behave strangely there. Because at a place of remembrance you can only turn inward or pray. And this contradicts the expectations associated with a tourist excursion to a “place for learning”. Another question for me was whether it’s possible at such a place to make the experienced horror comprehensible. In “Austerlitz” you realized a very consistent aesthetic. The film is shot in black-and-white. It consists in long, clearly composed and static settings. There’s no commentary or background music, and no interviews or intertitles. The audience itself is called upon to open up what is shown. It’s very important for me in my work to give the audience scope for its own thoughts. I don’t want to impose my opinion. For me, cinema is what takes place in the minds of the viewers. The film’s aesthetic aims at creating distance and to detach the filmed events from their everyday contexts, from so to speak the flow of life. That’s the basic prerequisite for reflecting about something. Your film insistently shows the mass tourism at the memorial sites: the sun is shining, the visitor are wearing casual clothing, backpacks and sun glasses. And almost all the visitors are equipped with smartphones, cameras and audio guides. You could think they were viewing a castle or a park. All in all, it seems this kind of mass tourism is inappropriate for a memorial site. Did you shoot the film in summer so as to emphasize this? Each viewer must decide for himself whether the people are behaving appropriately or not. I thought the film would work best in summer – because then things come to light more clearly. It’s a means of hyperbole: so as to make something visible, I have to reinforce it. But basically what clothes the visitors are wearing isn’t the decisive point. Indifference can’t be concealed. You can see it the eyes. “Austerlitz” by Sergei Loznitsa | Photo (detail): © déjà-vu film How do you explain the behaviour of the visitors? People who visit a former concentration camp are there confronted with death. Death, like birth, is a part of the human cosmos. But in our culture, it, together with religion, is blocked out of life. 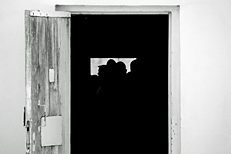 That the visitors behave as you can see in the film has certainly also to do with their not knowing how to treat death. 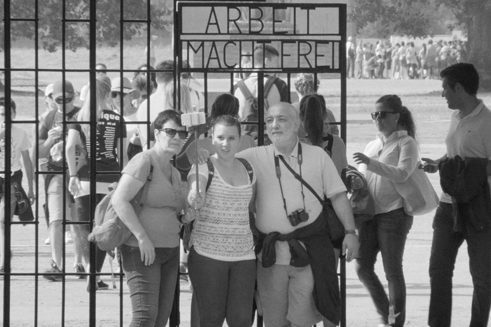 It’s striking that most of the visitors to the former concentration camps take photographs or even selfies. It’s particularly disturbing when people pose at the gate next to the infamous sentence “Work Sets You Free”. Why do people photograph themselves at such a place? There are undoubtedly many reasons for this – the memorial sites are visited by very different people. The philosopher Zygmunt Bauman and the cultural scholar Aleida Assmann have studied this question. We can certainly say that people who come to these places are looking for ways of self-identification. You usually take photographs so as to share a memory with someone later. But do you really want to share with your neighbours a photo or a selfie of the entrance sign emblazoned with “Work Sets You Free”? It’s an interesting question. For me, by the way, it was also interesting to see which nationalities come to visit former concentration camps. Apart from Germans, there are many Americans, Australians, Italians and Spaniards – but only a few groups from Eastern Europe. “Austerlitz” by Sergei Loznitsa | Photo (detail): © déjà-vu film How, in your experience, is the Holocaust remembered in Eastern Europe – at the places in Belarus and Ukraine where massacres of the Jewish population were committed during the Second World War? In the former Soviet Union there are hardly any memorials for the Holocaust. Take the example of Kiev: at Babi Yar tens of thousands of Jews were shot after the German invasion. But it was only in the 1970s that the first memorial was established. It had to be fought for. It also took decades for commemorative culture to develop in Germany against considerable resistance. When something so terrible has happened, you have to confront it, you can’t ignore it. Today we know that suffered traumas are passed on for generations. I therefore think it’s very dangerous not to face these issues. Sergei Loznitsa | Photo (detail): © déjà-vu film Sergei Loznitsa was born in 1964 in Belarus and grew up in Ukraine. He has also worked as a researcher at the Institute for Cybernetics in Kiev. In 1997 he completed his film studies in Moscow. Loznitsa has made several short and long films, including the documentary Maidan (2014) and the feature films My Joy (Schastye moe, 2010) and In the Fog (V tumane, 2012). In 2016, his documentary Austerlitz was awarded the Golden Dove, the main prize of the Leipzig international festival Dok. Since 2001, Loznitsa and his family have lived in Germany. 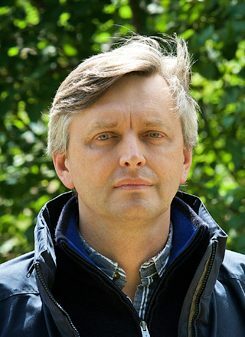 Jörn Hetebrügge is a freelance author and journalist with a special interest in film and art. Copyright: Text: Goethe-Institut, Jörn Hetebrügge. This work is licensed under a Creative Commons Attribution – Share Alike 3.0 Germany license.